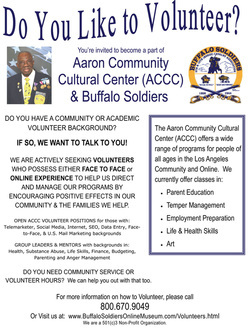 Volunteering is a very important role within the Aaron Community Cultural Center and the Buffalo Soldiers Online Museum. We are always actively seeking trained professionals that have the desire to share their expertise while a part of our ACCC family and the families we help. You are on this page because you responded to our text or email message and are interested in either becoming a Volunteer or a Mentor or you are in need of completing court required Community or Volunteer hours. Please take a moment out to fill out this Volunteer form.